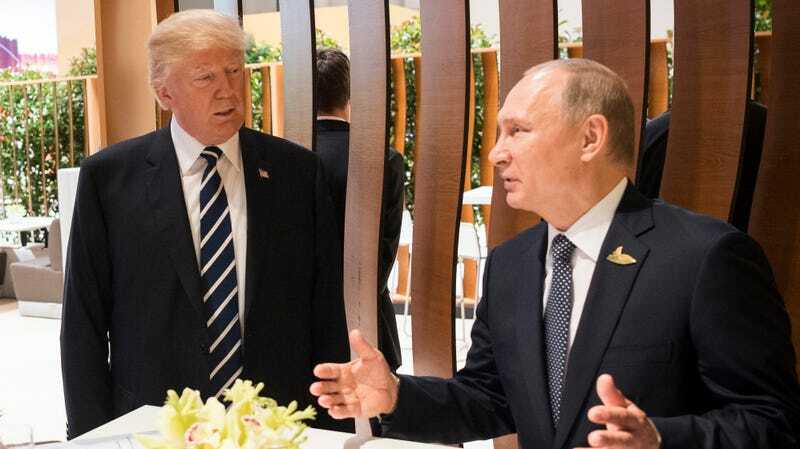 In this photo provided by the German Government Press Office (BPA), Donald Trump, President of the USA (C) meets Vladimir Putin, President of Russia during the G20 Summit on July 7, 2017 in Hamburg, Germany. President Donald Trump said he “hadn’t thought” to ask Russian President Vladimir Putin to extradite the 12 Russian military officers indicted by special counsel Robert Mueller for interfering in the 2016 U.S. presidential election by hacking the Democratic National Committee and stealing documents and emails that they later made public. Jeff Glor: The Russians who were indicted, would you ask Putin to send them here? President Trump: Well, I might, I hadn’t thought of that. But I certainly, I’ll be asking about it. But again, this was during the Obama administration. They were doing whatever it was during the Obama administration. And I heard they were trying, or people were trying, to hack into the RNC, too—the Republican National Committee—but we had much better defenses. I’ve been told that by a number of people, we had much better defenses so they couldn’t. I think the DNC should be ashamed of themselves for allowing themselves to be hacked. They had bad defenses and they were able to be hacked. But I heard they were trying to hack the Republicans too, but, and this may be wrong, but they had much stronger defenses. Release the exhausted sigh that built up while reading or listening to that repetitive word salad. Trump is correct that the Russian hacking efforts took place during the Obama administration, though it’s not really clear what that matters since the indictments have been issued during his administration. As president, he has an obligation to protect the nation’s interests. That’s kinda his whole thing! And yet, he demurred. Even with the pointless deflection of blame directed at the Obama administration, there are enough connections in the indictment that you’d think might make the whole thing of interest to Trump. According to the indictment, the military officers were responsible for hacking the servers of the Democratic National Committee and stealing hundreds of thousands of emails and documents, which they disseminated online over the course of the elections. While the document doesn’t directly name any Americans, it does make mention of some, including one person (probably Roger Stone) who had “regular contact with senior members of the presidential campaign of Donald J. Trump” and was in contact with the Russian hackers operating the Twitter account known as Guccifer 2.0. Then there’s this connection the Department of Justice made: Back on July 27th, 2016, Trump took the stage at one of his rallies and said, “Russia, if you’re listening, I hope you’re able to find the 30,000 emails that are missing...I think you will probably be rewarded mightily by our press.” According to the indictment, the Russian officers launched a spearphishing campaign that targeted email addresses at a domain used by Clinton’s personal office later that day. So maybe Russia was listening after all. Don’t hold your breath for Trump to actually follow through with the extradition demand. As the Washington Post pointed out, the US doesn’t have an extradition treaty with Russia, and Trump administration officials are already downplaying the possibility of prodding Putin with the request.